May | 2012 | eBeam Rocks! The following article offers several interesting points when discussing the changes being made in our classrooms today because of all of the wonderful technology that is now available for schools. Of course I also really found the article awesome because it points out that an advanced math teacher in an Alabama middle school has had great success with the eBeam Engage (I’ve highlighted this section in the article below). I guess what I believe to be the most important aspect of technology in the classroom is that it’s only truly helpful if both the teacher and the students are benefiting from its use in the classroom. In the article, it’s noted that Melissa Dodd with the Boston Public School District stated, “We’ve seen increased student engagement, a decrease in disciplinary issues and improved class attendance when the teachers utilize technology within the curriculum.” That to me is true success in the classroom, resulting in happier teachers, students, and parents. I found the following article at http://www.peterli.com/spm/archive.php?article_id=3438. The classroom environment a few years ago consisted of the bare-bones basics: desks, chairs, large chalkboards, pencils and notebooks — that is, the metal spiral-bounded books with lined notepaper inside. Compare those classrooms to the ones of 50 years ago and there wasn’t much difference. How times have indeed changed!Step inside a K-12 classroom in many school districts in the U.S. today and the differences are truly jaw dropping. Some might even feel as if, like Alice, they have fallen down the proverbial rabbit hole into another world. Instead of writing spelling words on the chalkboard, today’s teachers are now utilizing interactive “smart” whiteboard technology to make their classroom experiences intuitive and engaging, and to provide a better overall learning environment for their students. Other new offerings making their daily appearance in the classroom include Apple’s iPads, computer workstations, instructional software and web-based apps. Some school administrators might be hesitant to add or update technology in the classroom because such an undertaking requires a support staff to manage it and handle troubleshooting. The parents at one Pennsylvania school took that job under their own belts. Sacred Heart School in Royersford, Penn., is a Catholic K-8 community of approximately 190 students. While the school administrators realized that they needed to update the infrastructure for the classrooms, they didn’t have to look beyond their own backyard for the technical support that they needed.The school board at Sacred Heart worked to procure the necessary grants and fundraisers were held to offset other costs. A volunteer technical committee comprised of parents who were knowledgeable in the IT field worked to obtain the classroom technologies and then implement them. Derek Loranca, a parent of a Sacred Heart student and a lead business intelligence specialist for a Fortune 1000 company, served on the committee. “The parents knew that it was critical for our kids’ school to have new technologies, so we came together to do it ourselves. We were fortunate to have one person on the committee who was well versed in hardware, while another parent had a background in software. One parent offered assistance in phone systems. We utilized all of these resources to work together,” Loranca says. “Sacred Heart never had to pay for an IT staff because the parents on the technical committee handled all of the main IT tasks like integration, implementation and troubleshooting.”The technical committee implemented a wireless network so that every Sacred Heart classroom had Internet access. In addition, a web file server was added so that students could log into the system and work on school projects from home. The committee also used a kiosk-like model for the classroom setting. This system consisted of a desktop virtualization offering that allowed for the use of multiple monitors, mice and keyboards without the purchase of additional desktop computers. One computer could support multiple virtual desktops, which boosted cost savings. In addition, every classroom has a smartboard for learning.As an off-shoot to the technical committee, it was determined that another group of volunteers would be necessary to assist with typical problems that came up from time to time. This group became known as the classroom ambassadors, a team of parents who took on the role of a traditional helpdesk. “Students and teachers both had access to these ambassadors to answer basic questions about the technology. If the classroom ambassador couldn’t answer the question or find a resolution, he or she simply brought the issue to the technical committee for the needed help,” Loranca says. The ambassadors could solve basic problems like figuring out why a particular program wouldn’t load or determine the reason a projector wasn’t working properly without the need to escalate the issue to the technical committee. Now that you’ve read the article and you’re wishing that you had an eBeam Engage, take a look at our website and our great prices! ebeamrocks.com. If you mention my blog when you order you can get a 10% discount, and make me look awesome with my boss! Following the recent launches of the Mac and Linux software betas, Luidia has just released the Windows beta version of the upcoming Scrapbook software. All three beta software releases are available for download from ebeamlabs.com. These versions are all integrated with eBeam Connect and offer a better, more consistent user experience for you! I found the following article at http://www.wired.com/reviews/2012/05/ebeam-edge/. Except for the spiciest bits of The Social Network and the Steve Jobs biography, pretty much everything that happens in a conference room is boring. Meetings are boring, presentations are boring, and whiteboards are boring. But here’s a piece of technology that makes all three more exciting — which admittedly isn’t that difficult, but stay with me. It’s called the eBeam Edge, made by Luidia. It’s a handwriting capture system that adds an interactive element to whatever you’re viewing on your wall, allowing you and your colleagues to annotate a projected image or document, or to sketch something on a whiteboard, and e-mail the results around like a memo. The eBeam is just one entry in the “interactive whiteboard” category — devices that let you virtually draw on any vertical surface using a special pen and have it captured electronically by a combination of hardware and software. 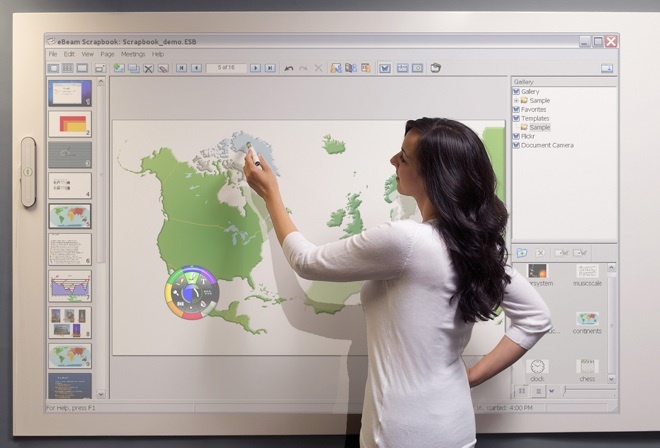 Some of these systems use touchscreens or pressure-sensitive displays, some use interactive projectors, and others use special whiteboards. Luidia’s device is simpler and less expensive than those, since it uses things you already have around the office: a regular projector hooked up to a Windows PC. 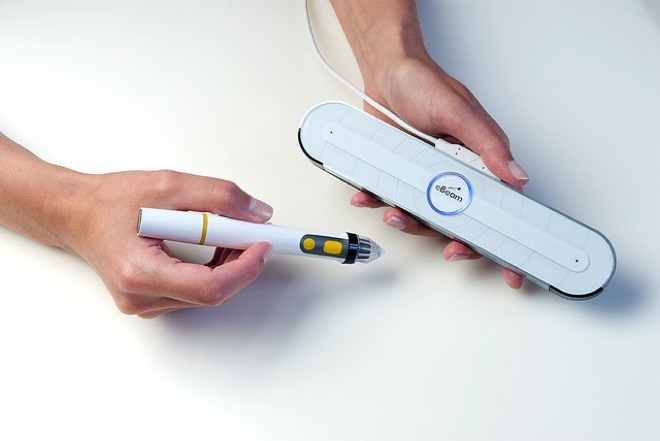 In the basic eBeam kit (priced between $900 and $1,050 around the web), you get a fat, marker-like stylus and a hardware sensor that connects to your PC via USB or Bluetooth. This sensor, which is about the size of a candy bar, attaches to the wall using a non-permanent adhesive (a couple of 3M Command strips). You just stick it next to whatever flat surface you want to use to make your presentation, then point the projector at that surface. To calibrate it, you tap the stylus on the nine points projected on the wall. The whole setup process takes less than five minutes. Once everything’s running, you can draw images or write text with a surprising level of accuracy. The eBeam’s stylus, which has a AAA battery inside, is tracked by the flat capture strip you’ve fastened to the wall. The tracking is pretty good — there is some lag, but it’s not too annoying. It’s about the same amount of latency I’ve experienced using a stylus on a smartphone like the Galaxy Note, or a Wacom Bamboo stylus on an iPad. You just have to remember to write a little more slowly and deliberately than normal. Since it works on any flat surface, you can project the eBeam environment onto a map, a large-scale design mockup, or a large printed image. Where it really shines is when you use it in conjunction with a whiteboard. As part of my test, Luidia also sent me its whiteboard Capture Pack ($250 extra), a set of sheaths for regular whiteboard markers that have the eBeam tracking mechanism (the same one found in the stylus) built in. This way, you can draw on the whiteboard and have your every stroke recorded and captured. The sheaths are colored to match the common colors of whiteboard markers, and the software records the appropriate color — two people can use two different markers and keep their notes separate. The low point here is the software. Pressing one of the two buttons on the stylus brings up a radial menu (called the eBeam Tool Palette) that lets you choose between functions like freehand writing, highlighting, drawing arrows, erasing marks and flipping through the stack of open documents. Unfortunately, these menus are not that intuitive and take some getting used to, especially if you’re one of those people who lives and breathes PowerPoint. Also, and this is odd, the menus are not as responsive as the writing functions. I experienced too many misplaced taps of the stylus, and sometimes I had to tap twice or three times to get the software to react. eBeam’s software suite does have plenty of options for building and delivering presentations — slideshow tools, master pages, navigation elements to move forward and backward through a deck — and it has some collaborative features like the ability to stack transparent layers on top of your presentation, or to share your whiteboard with other users over the internet. But coming into the eBeam environment cold, it wasn’t exactly clear to me how these features work (and yes, I’ve been at this a very long time). A few web searches and YouTube videos had me sorted out eventually, but it was more time than I expected to spend learning how to use a piece of presentation software. Obfuscated user interfaces aside, Luidia’s system works well enough for me to recommend it. But it’s a very niche product with a steep price and negligible payoff. If you work in an environment where collaborative communion is the lifeblood of your organization — not just presentations, but constant prototyping, brainstorming, group critique and swapping of ideas — then the eBeam could wipe away your whiteboard woes. But for the average office, it’s a flashy, expensive solution to a problem that probably doesn’t exist. WIRED Mark up any document or image electronically and save it for perpetuity. Works on any wall or any flat, wall-mounted object. Uses the projector and PC you already have. Stylus is easy to use, and drawing surface is easy to calibrate. Optional capture pack enhances the boring whiteboard with the addition of computer magic. TIRED Software needs work. Any projector will do, but a projector is required. MSRP is $1,050, but it’s available for around $900 — still very expensive. Latency could be an issue for the over-caffeinated drones from sales and marketing. The eBeam Edge has done it again! In the recently released EdTech Digest Awards for 2012, eBeam Edge won for “Best IWB Solution”! Take a look at the following article, and then check out our website ebeamrocks.com so that you can learn more about the eBeam Edge and see our great prices! The following article was found at http://edtechdigest.wordpress.com/2012/03/27/2012-edtech-digest-awards-standing-room-only/. Sure, it’s only spring, but it’s already hot, hot, hot! The edtech space is sizzling with activity and the sharply increased volume of entries in this year’s EdTech Digest Awards Program indicates a marketplace further heating up with innovation, creativity and solutions—all at a very frenzied pace. It’s an overflow room this year with more than double the amount of entries as last. Not to be confused with the late ’90s dot-com scene, this crowd stands in stark contrast, identifiable more by hard-won wisdom and less by hollow hype. Technology and talent are stably coming together for education in a time of great budgetary change where old models continue to crumble as a new normal yet emerges. With school budgets cut by some $20 Billion in California alone over the past three years, vapid glitz-and-glamour solutions have no place when there are plenty of authentic, tried-and-true providers (or at least stable beta startups with built-in, on-the-fly quality improvement mechanisms). The best solutions are earning their places as they build out and scale up; they deliver with ease and efficacy, and in short, they’re real. Venture capitalists seem to think so, too. Over the last few years, they’ve provided at least a $1.97 Billion vote of confidence in educational technology companies closing more than 438 new deals with no signs of letting up. Behind the quality products and services, the apps and platforms, the content and clicks—are real leaders in the space who are under no illusion as to what it takes to get things done. These trendsetters, both people and products, are making it standing room only when it comes to the palpable, electric energy in the edtech sector today—and that’s very good news for the future of education. With still more excitement to come, let’s nonetheless go up on stage, front and center, and tear open the envelopes to announce the 2012 EdTech Digest Awards Program finalists—and winners! Awesome eBeam Deal- Time is Running Out! I wrote about this back in March, but this deal is awesome, and good through the end of May, so I wanted to put it out there again! Right now (thru 5/31), when you buy 4 eBeam Edge, you get a free eBeam Focus 150 document camera (msrp $499)! The eBeam Focus 150 document camera allows users to view and digitize real-world material instantly and import the content directly into eBeam Scrapbook. Capture snapshots or video of text, physical objects, and even people and import them into eBeam Scrapbook with the click of a button. The eBeam Focus 150 plugs directly into your computer’s USB 2.0 port and makes adding high-quality images and video into your lesson or presentation quick and easy. Very cool! Buy your eBeam Edge today at our website, http://www.shop.ebeamrocks.com/. Pick a winning deal on interactive classroom technology! Get an eBeam Focus 150 document camera FREE! Everyone wins with eBeam interactive technology. Purchase 4 eBeam Edge® Projection through an Authorized eBeam Reseller to take advantage of this limited offer. As I’ve said before, I’m the type of person that wants the “real story”. Real examples from real people make the most impact on me. Maybe it’s because I live in Missouri, “The Show Me State”, but I’ve always felt that a heartfelt true story means so much more than a bunch of statistics obtained from who knows where. So, that brings me to the following article. It’s from CNN’s School of Thought blog that discusses education, pre-K through college, from a variety of perspectives. The following blog post was written by Charlotte Walker, a teacher in Maine who teaches students who are deaf or hard of hearing. She discusses how technology (eBeam!) and traditional forms of teaching can be used together to provide an effective learning environment. Take a look! The following article was found at http://schoolsofthought.blogs.cnn.com/2012/05/03/my-view-students-with-hearing-loss-benefit-from-mix-of-technology-teaching/. Because my students love technology, I made it one of my priorities to use more technology in the classroom. At the beginning of the year my co-teacher and I used YouTube as a way to post videos of us reading books connected to our curriculum, in both spoken English and ASL, that the students could access in the classroom and at home with their families. I also created different picture walls documenting activities such as nature walks around the island where our school is located. I hang the pictures at their eye level and ask them to tell me about what they see. I then scribe their description and post it under the photo. The students love seeing themselves in pictures and are excited to use language to describe the experiences. As I mentioned, preschool students have a limited attention span, especially for analog tools like flash cards, so I took a cue from their enthusiasm over the iPad and searched for a more interactive way to present my lessons. Another piece of technology I have implemented this year has been the use of the Luidia eBeam, which is a small, portable interactive whiteboard device that allows me to turn any surface into an interactive whiteboard. Because this device is mobile, my co-teacher and I are easily able to share it between the two sides of the classroom, and set it up to work at a level where the children can reach and interact with it. I have used the eBeam on our dry erase board, the back of a bookshelf, the bathroom door (not the best idea!) and also on a wall. I was excited to see the immediate impact technology had on the learning environment and on the excitement level among my students. Bringing tools to these digital natives has enabled them to explore and build farms, go on deep-sea adventures with polar bears and penguins, and even create their own working roadways using the interactive stylus. They can experience language and learning for themselves by interacting with the lesson. The exposure to new things, such as watching penguins in their natural habitat, entices my students to ask questions and use language with excitement. For example, a student with lower language was watching a penguin swim underwater and exclaimed, “Foot, foot!” and I was able to clarify that the penguin had flippers and explain what they were used for. This small discussion turned into the students walking and swimming like penguins during free-play time and talking about their flippers. Thanks to technology, we can bring books and stories to life for our students. Many classic children’s stories can be found on the Internet, often being read by the author, and many have interactive activities for the students to enjoy after the storytelling. Can much of this teaching and learning be done without the use of technology? Sure, which brings me back to the importance of balance between the use of technology and traditional methods of teaching. But while my students enjoy reading books, creating art and exploring our island, they have grown up with technology, and in order to reach them, we as educators must learn to adapt to meet them in their comfort zone. My students get very excited when they see that we’ll be using technology. Since taking a more integrated approach with these tools, I sometimes catch myself getting overwhelmed with how much talking is happening during a lesson in which we use it. What a wonderful thing to be overwhelmed by in a room where eliciting spoken language is my goal!